Keeping your kids’ teeth and gums healthy and instilling in them a lifetime of good oral hygiene habits is a job that starts well before they can stand on a stepstool in front of their sink to learn how to brush their teeth properly. Starting at age one, for example, children should get regular dental checkups every six months. Kids should begin learning the proper way to brush their teeth and making it a regular part of their routines while still toddlers. But other effective oral health practices are not recommended at such a young age. This includes the use of mouthwash. 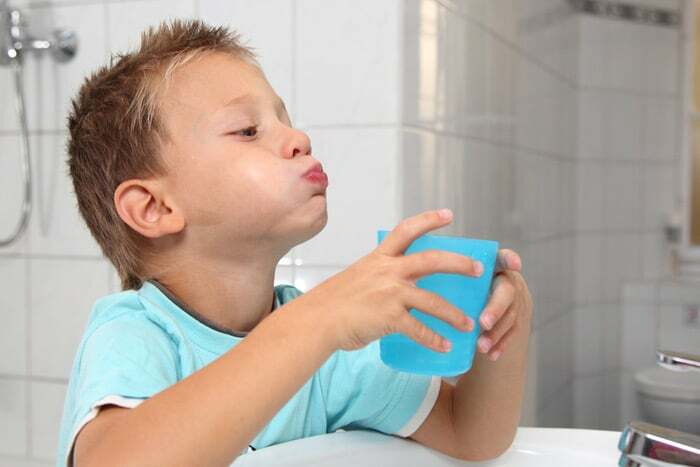 Typically, parents should wait until age six to introduce their child to mouthwash. There are two reasons to hold off on mouthwash until a child is a bit older, one having to do with the substance of mouthwash and the other relating to the technique of using mouthwash correctly. Just like there are toothpaste and toothbrushes made especially for children, there are brands of mouthwash designed to appeal to young palates. But many children’s’ mouthwashes contain fluoride. While this may sound like a good thing, it actually can be bad for kids’ still-growing teeth. Exposure to too much fluoride when teeth are still forming can lead to a condition called fluorosis. Using fluoride mouthwash before teeth emerge, especially when a child is getting fluoride from other sources such as fluoridated water, can cause this cosmetic condition. Mild to moderate fluorosis can leave white lines, streaks or spots on the child’s teeth. In more severe cases, the teeth can become pitted and have brown, gray or black spots. While these discolorations are not harmful, they are permanent. The other reason to wait before introducing your child to mouthwash is to allow them to develop the maturity to use mouthwash the right way. Mouthwash should not be swallowed, but it can be hard for kids to get used to the idea and action of swishing liquid in their mouth and spitting it out rather than swallowing it. That is why it is a good idea to have your child practice with water first. Supervise your child and walk him or her through the process, telling them when to start and when to spit and reminding them not to swallow. As with brushing, modeling the right way to use mouthwash is a great way to teach a child how to integrate the use of mouthwash into their daily routine. Once they get used to the idea of swishing and rinsing with water, they can move on to the real thing. At Assure a Smile in Miami, we take pride in our efforts to make going to the dentist a pleasant and comfortable experience for kids. Rather than seeing a dental appointment something to dread, kids can grow up thinking of it as positive and healthy, and maybe even fun. Miami parents may request an appointment online or speak directly with our front desk at 305-274-0047. We look forward to meeting you and your child.